So I had a guy call us looking to replace the bench seat in his very special 1950 Studebaker truck. He’d been looking everywhere and after all of his research, he found nothing. Until he called me. Turns out, we don’t have a seat that is specifically designed for the Studebaker, but Greg was willing to trust me to make the right seat for him based on the dimensions he had to work with inside the cab of his truck. Thankfully, Glide Engineering has the right frame to fit this application, but not the exact mounting hardware. Grenade Motorsports in Ohio, who is actually building the truck, will have to do a little modifying to mount the seat to his floor board, but the fabrication is minimal. For the 1950 Studebaker, we used Glide’s part # 9459 no flip. Most of the frames that come from Glide can be made with a really cool feature that allows you to flip the bottom cushion up for under seat storage or access. If you ask for the flip version of this seat, it adds a couple of inches to the width. That wasn’t going to work for this project, so we went with the standard bench seat with split backs. Another vision Greg had for the interior of this truck was to have side bolsters built into the seats and a hump built into the center of the seat cushion. He has a history of street racing and really likes the feel of a standard racing seat and how the bolsters hug the body. We didn’t have this design or detail already built in for this seat style but I like to come at things with a positive attitude. Rather than saying “NO”, I was totally willing to work with him to make his vision come to life. It took about 5 weeks, but we build up the foam and created new patterns so Greg could have his new seat just the way he wanted it. Another personal touch Greg added was the leather. He found his own leather supplier who carried the perfect shade of distressed brown to pull off the look he was going for and had them ship the material strait to us. Now we have an aftermarket, original style bench seat with personal and modern touches by the truck owner. We can’t wait to see the seat installed. Thanks for the opportunity Greg and Grenade Motorsports. We had fun on this one and everyone here at Cerullo is proud to have been a part of this truck’s journey. I picked up the seats yesterday and was very excited to install them! The installation went without a problem, the Cerullo brackets I ordered lined up perfectly with the factory holes. The special request to match the original stitching from the original 69 bucket seats adds a beautiful mix of old and modern look that compliments the build. What a difference in sitting and driving, able to take a curve without sliding to the passenger side is exactly what I wanted. Did I tell you they look they look AMAZING! Please extend my deepest gratitude to Miguel and to you for making this happen. Special projects have been plenty lately here at Cerullo Performance Seating. From time to time our customers request a pattern change on our seat designs. Most of the time it is very doable. This is a custom design that I'm jealous we didn't come up with ourselves. It turned out beautiful and the response on our social media pages is greater than it's ever been. Mike from Canada called us a few weeks ago needing seats for his 1969 Dodge Dart. He had an idea of keeping with the original feel of the 1/2" pleats but still wanted an aftermarket, modern yet classic design. He sent us photos of other seats he wanted the upholstery to look like. When he said he wanted red vinyl, we got very excited. Red always looks so striking and sporty and flashy. It makes our days even more fun when we get to use bright colors like that. I think I've said that many times on these blog posts, sorry. Here are Mike's Cerullo SC Sport Seats in red vinyl with custom design for his 1969 Dodge Dart. He did order mounting brackets as well that will allow him to install his brand new seats right away with no fuss. They say the best advertising comes from "word of mouth". I totally agree. Our friends at Ridetech https://www.ridetech.com/ in Jasper, Indiana sent over a really cool guy, who is actually local, to work on new seats for his 1971 Mustang Mach 1. This is a very special car. He shows it everywhere, all the time. He had purchased some aftermarket replacement seats already that were imported and inexpensive. These didn't last long of course because they were very uncomfortable. 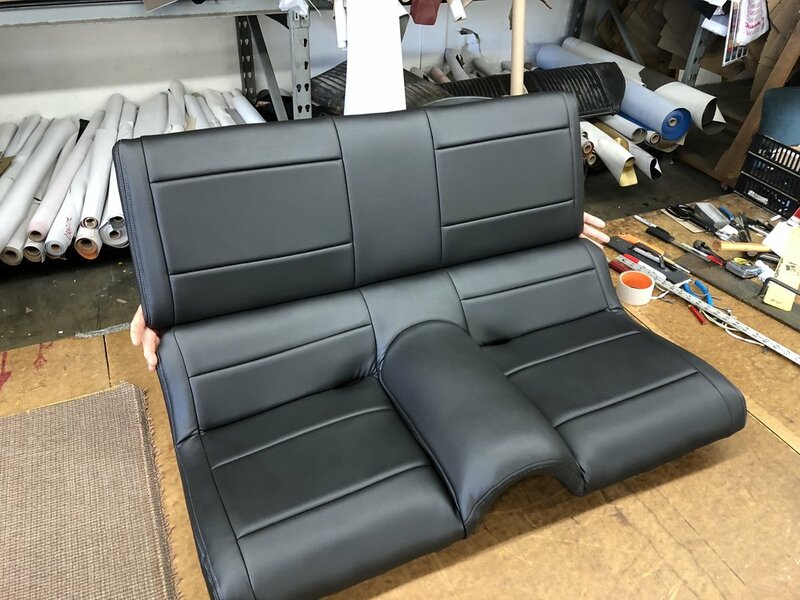 This dude came to us needing a new set of front seats that were high quality, comfortable for his back and legs and needed a new cover for his rear seat to match the front. Keeping with the sporty look of the car, he chose our XR Sport Seats in black vinyl with light grey stitching. Adding the contrasting thread color breaks up all of the black you see when you look inside the car, giving a little more character to the interior. Guy, the customer, is a very handy and car savvy person but didn't feel like dealing with the issue of building his own mounting brackets to adapt our seat tracks to his floor board. He chose to have us build his mounting brackets so that the installation process would be flawless. His front seats turned out great. The XR's always look so elegant in any vehicle you put them in. We weren't sure what we were going to find as far as the condition of the seat foam in the rear seat but all was intact when we pulled the original cover off. This car has been maintained very well over the years. Covering it was a breeze and we can't wait to see everything installed in the car. Watch out for this Mach 1 at the Goodguys shows. He seems to hit all of them. Thanks Guy, this was a fun project. This Photo shows the original cover on the rear seat of the Mach 1. So now we have this pattern available for this type of truck for future orders. Give us a call for a quote. 909-392-5561. Do you have questions about our mounting brackets? Here are some frequently asked questions answered. 1. Cerullo mounting brackets are designed to fit Cerullo Seats. The fitment on other brad of seats cannot be guaranteed. The mounting points from our sliders to the brackets are 11" front to back and 16" side to side. If that fits the bottom of your sliders of another brand of seats, then it will work. 2. Cerullo mounting brackets are car specific, meaning that there is a specific mounting bracket design for each model and may also be different according to the years. We have a detailed list, so if you want to know if we have a mounting bracket that fits your car, just give us a call and we can look it up easily. 3. When you order Cerullo seats with no brackets, you will get sliders that have studs pointing downward that can be either bolted to the floor (if your floor is flat and you need to be as close to the floor as possible) or bolted to a custom or self fabricated bracket that fits the design of your floor. When you order Cerullo seats with Cerullo mounting brackets, you get a set of "black sliders" that work specifically with the design of our "Recaro style" brackets. You will also receive a set of adapter brackets that will hook onto the tabs that run along the top of the brackets. These adapters allow you to adjust the height and tilt details of your seats during installation. You can see the adapters placed on top of this bracket in this photo. Also at the top of the photo you'll see a sample of the black slider that will fit on top of the adapter. 4. When you order a set of brackets, you'll notice that both brackets are marked with a part number. If it is not clear to you automatically which bracket fits on which side of the car, just remember that the even number is the driver side and the odd number is the passenger side. We had a walk in customer with a classic Ford truck looking for a new bench seat last month. His truck is silver and he wanted to include that color in the seats without getting too glitzy. Our silver vinyl from Katzkin was the perfect choice. It has an iridescent shine to it that gives the "silver" look yet is not shiny. Spread out over a large surface like the inserts of a bench seat, it ties in with the silver paint of the truck and the black outer trim gives a sharp pop to the interior. We're grateful for the progress picture from our customer. We'll post more as the truck comes to completion. © Copyright Cerullo Performance Seating® 2015. All rights reserved.